17 Skakovaya St., bldg. 2, 7th fl. 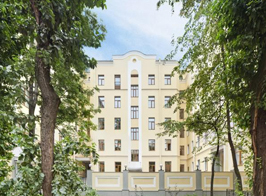 The road from the subway to ABU office takes 10-15 minutes by foot (exit from the metro station Belorusskaya in the direction of Belorusskiy railway station (the only exit from the station)). At the exit turn left, take course along the railway station building and walk into the Entrance 4 “To Leningradskiy prospect”. At the exit go straight to Nizhnyaya street (around 50 meters), turn left and walk down the street which verges into Skakovaya street. 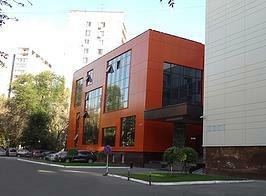 On the right side along the street there is an 8-floor administrative building with a car parking in front and a signboard «Rosgrazhdanrekonstruktsiya» at the entrance. At the reception on the ground floor please give your name to enter the building. Our office is located on the 7th floor. Please pay attention: The traffic pattern on Skakovaya and Verkhnaya streets was changed! When driving from the city centre pass the bridge above Belorusskiy railroad and turn immediately to the right, under the bridge. After passing under the bridge, turn left to the Nizhnyaya street and proceed until the junction with Verkhnyaya street. Turn right to the Verkhnyaya street (the one-way street) and proceed until the junction with Skakovaya street. Turn left to the Skakovaya street (the one-way part). On the left side along the street there is an 8-floor administrative building with a car parking in front and a signboard ‘Rosgrazhdanrekonstruktsiya’ at the entrance. At the reception on the ground floor please give your name to enter the building. Our office is located on the 7th floor. Form Leningradsky prospekt after crossing the Third Transport Ring take the right turn to Skakovaya alley, then after 50 meters turn to the left (Skakovaya alley verges into Skakovaya street which runs parallel to Leningradsky prospekt). On the left side along the street there is an 8-floor administrative building with a car parking in front and a signboard ‘Rosgrazhdanrekonstruktsiya’ at the entrance. At the reception on the ground floor please give your name to enter the building. Our office is located on the 7th floor. ADP, the ADP logo and ADP A more human resource are registered trademarks of ADP, LLC.